I just need to admit something right up front: this is all my fault. I have badly abused a tree and whatever the equivalent of the DHS is for trees should be called on me. 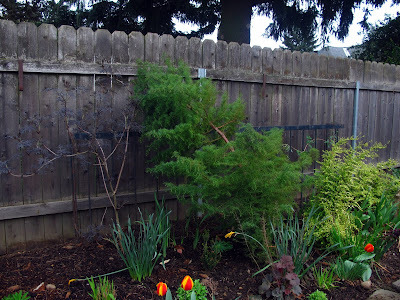 In the NE corner of my yard, the one I want to be the focal point of the garden, I planted a Cryptomeria japonica 'Elegans.' It was beautiful. But then we took off its braces and lines and it started slouching. It got much worse than this. I finally yanked it in November and put it the only place I had room: the vegetable bed. And it immediately flopped over and I did nothing. I just left it like this all winter because I am a terrible person. I needed to plant up the vegetable garden but I didn't have a big enough pot for the tree. I was hoping to pawn the tree off on Jane, who I was confident could teach it to stand up straight again. So I plopped it here, just to the right of where it used to be. I was hopeful that it standing up straight-ish. I thought, "Maybe if it's a little more protected, with some shrubs to lean up on, it will be okay." But then I realized that the Cryptomeria will always be bigger than the Korean fir. And while I was in the shower I thought, maybe I'll just plant a deciduous tree like a Japanese maple and be done with it. Yes, they're ubiquitous (and not evergreen) but they are pretty. And then the Cryptomeria did this and I'm back to thinking it can't be saved. Can this tree be rehabbed? And what would you plant in this corner? I feel like it needs to be anchored with something tall, preferably evergreen. I currently have a bunch of grasses and Joe Pye weed planted in the back, so we'll have winter interest next year. I still feel like it needs an exclamation point, though. 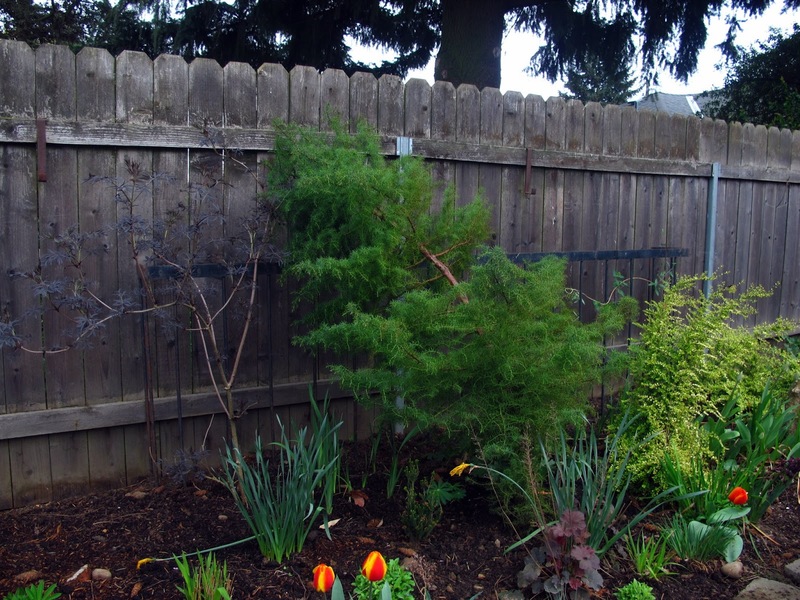 Maybe I should just move the potted weeping blue spruce here and call it good? If you have ideas or opinions, my ears are open. Apparently Cryptomeria elegans just does this -- the trunks twist, or as it is most frequently described "they curve over on themselves". I think the leaning look is what constitutes the "elegans" feature, making these become interesting shaped trees. In open areas where they have lots of room they are straight trunked, but in protected spots they get loopy. So.... is it a look you can live with? I think it is doing what it should. If it is always going to drive you crazy, take it out and . . .
. . . . I vote for an interesting Japanese maple as a replacement. I lust for 'Seiryu' (Blue Green Dragon) but don't have a protected part-shady spot for one. Will you grow one for me and post on it? You are the best. And I LOVE Chief Joseph. I wish it wasn't so slow growing (and expensive!). Oh, 'Seiryu' is SO pretty. You might have yourself a deal. I love the trunk! We were planning a trip to the Oregon Garden anyway, so this is a great idea. Thanks! I dunno, it seems like any tree that can't stand up on its own is really not much of a tree. I would think that not falling over would be one of those basic tree requirements. I think you're better off without. Just saying.